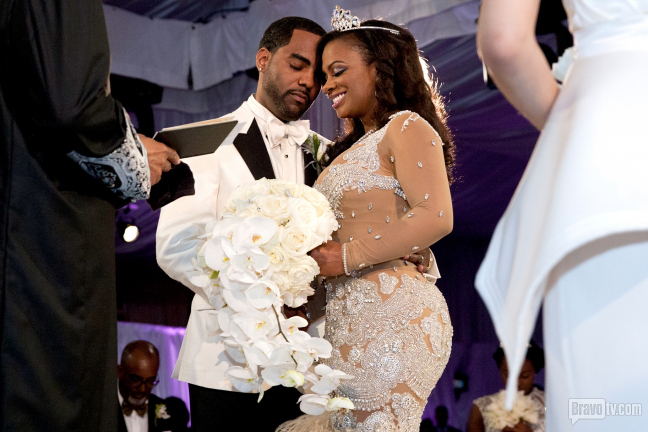 Bravo is keeping up the television foolishness with this reality wedding drama series starring Kandi & Todd. Her mother is unhappy, Kandi is crying & Todd has issues with the pre-nup saying that ‘all they care about is money’. This looks like a recipe for disaster to me. When will someone document positive, loving, peaceful experiences? Or does anyone not want to see that any more? Word to wise, when watching these tales unfold, think of it as a cautionary tale, and an example of what NOT to do. Also, it was rumored that she was 5 hours late to her own wedding. Ain’t nobody got time for that! I’ll start on a lighter note, that dress… Looks like that alpaca rug that Denzel Washington had an American Gangster. As far as the union and wedding, I wouldn’t have aired it on television. Especially considering how much of low class and immature her mother has been behaving. The picture with both mothers is a shame. I wouldn’t even invited my mother to take pics of she is gonna frown. Whether or not Kandi’s mother feels she is making a mistake, she should still be supportive and play nice. I have seen a lot of things in my life. But never have I seen a grandmother try to physically assault someone. Especially in the manner the mother did. She should crawl under a rock and hide. She thinks she is protecting Kandi and her daughter when she is actually making that family look like some common hood rats. Definitely not acting like a role model for her granddaughter. As far as a prenup, I believe Kandi should have one. It makes sense. She made tons of money before their relationship. She deserves to keep every dime of it. We saw what happened to Nas & Kelis. I’m sure that came up during their engagement and he chose not to get on because he felt like it was forever. And when it didn’t work out, she took him to the cleaners. So respect and loyalty don’t mean ish in the long run when it comes to divorce. Makes sense to me Troy. This entry was posted on April 30, 2014 by Toiah in Everything you want and tagged Kandi, Real Housewives of Atlanta, Todd Tucker, Wedding.